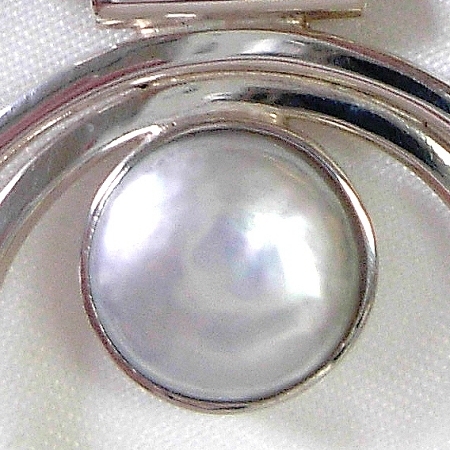 Art Deco Jewelry - This is a wonderful every day sterling silver geometric pendant that features a cultured freshwater white coin pearl (13mm). This limited edition handcrafted necklace includes an 18" snake chain. Limited Edition Necklace. 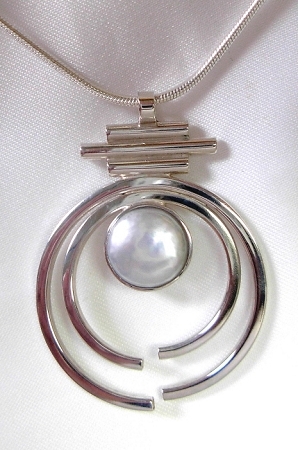 This is a handcrafted Sterling Silver Pendant created with square and round silver tubing which frames a white round fresh water pearl ( approximately 13mm in diameter ). The handmade pendant comes with an 18" Sterling Silver snake chain. Signed and created by Aaron Rubinstein and Modern Art Jewelry.